The 90th annual Academy Awards are just about here! This March 4th, Jimmy Kimmel returns as host and anybody who is anybody in Hollywood will be in attendance. I, on the other hand, will be watching it on the television, wearing pajamas and holding a cup of tea and a large chunk of chocolate. 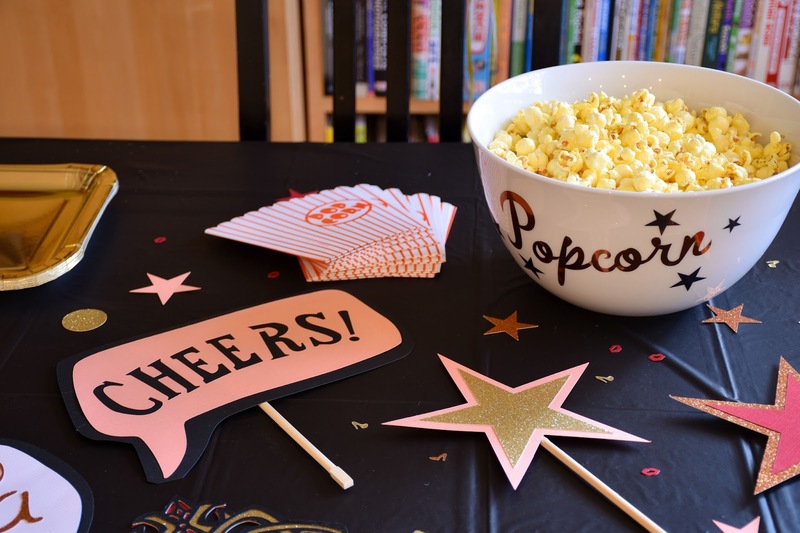 We did recently hold our own Oscars party, though. And by recently, I mean in the fall. 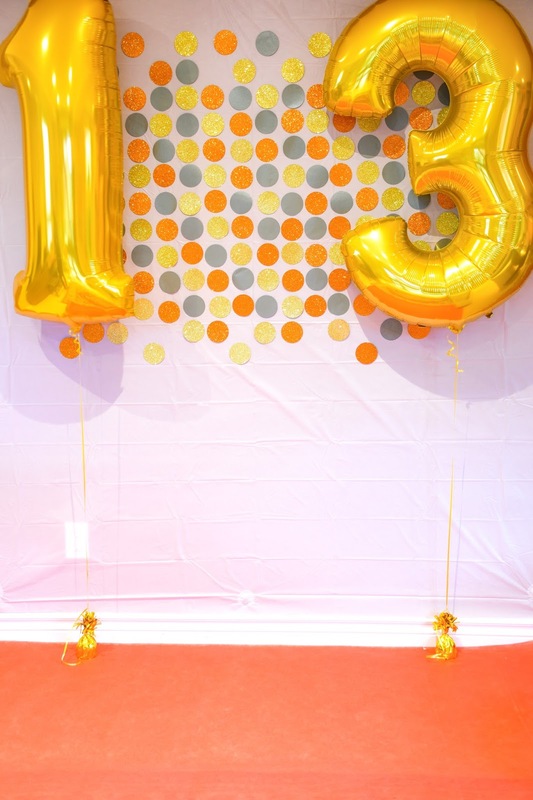 It was actually my daughter's 13th birthday party and she wanted an Oscars theme. 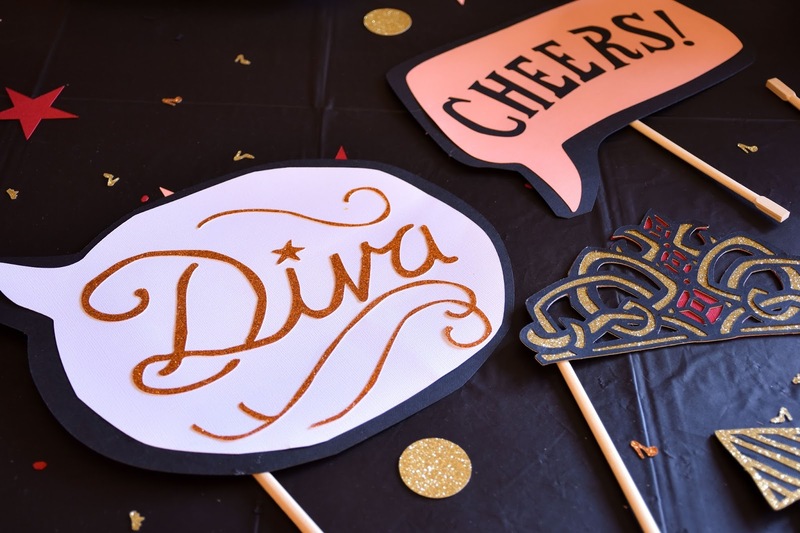 I turned to my trusty Cricut Explore Air™ for Oscar-inspired black and gold party decor. 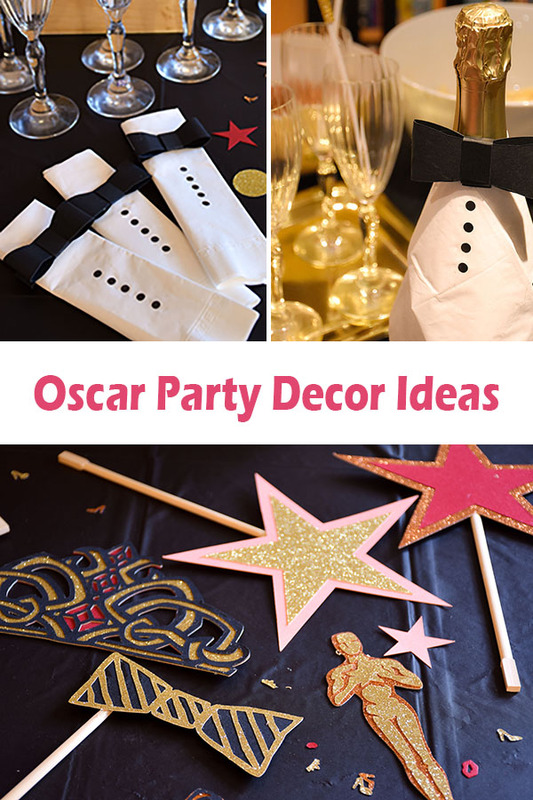 I thought I would share the party decor details with you today in the hopes that you can use a project or two (or three) for your upcoming Oscar fête. All of the projects can be found ready-made in Cricut Design Space. I used a whole whack of glitter cardstock for these projects. It's one of my favourite materials. There's something so cheering about it. It's perfect for Christmas projects, New Year's Eve projects and anytime you want some glam really. 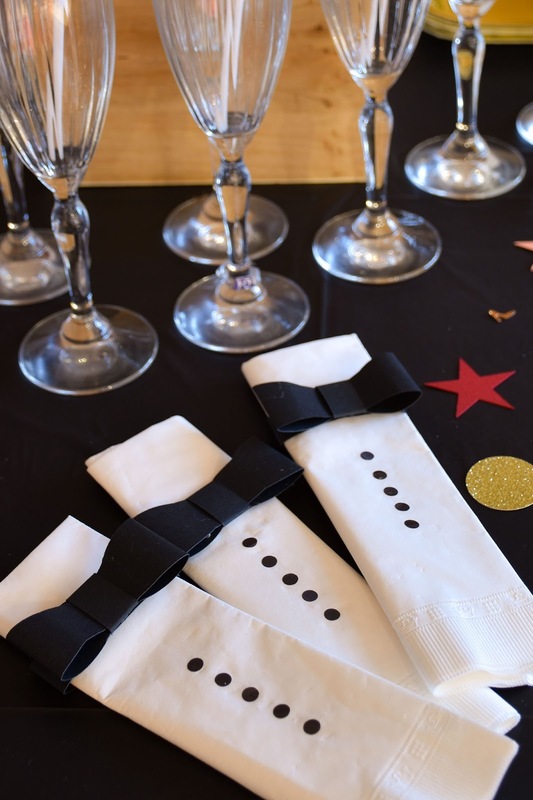 I made simple projects like napkin and bottle tuxedos (that only require black cardstock) and slightly more complicated or time-consuming projects such as the photo backdrop. I cut and glued a bunch of party props for the girls to pose with, like "Diva," glittery stars, a bow tie, a mustache and a crown. I glued on disposable chopsticks from sushi restaurants as handles. Of course there were photo props of Oscar himself, for the winners in the group. (They were all winners.) My daughter helped me to cut cute high heel shoes, crowns and lips for table confetti with the very fun (and portable) Cuttlebug® Machine. 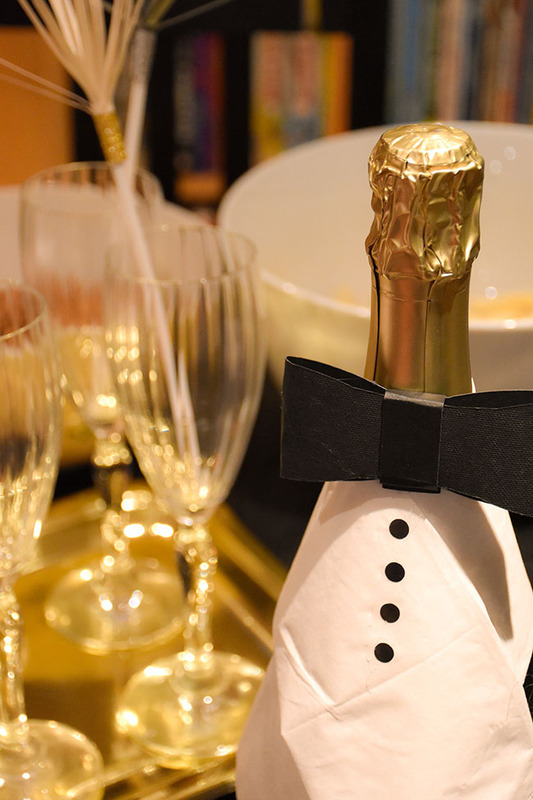 Even our sparkling juice bottle was dressed in a tuxedo for the occasion. 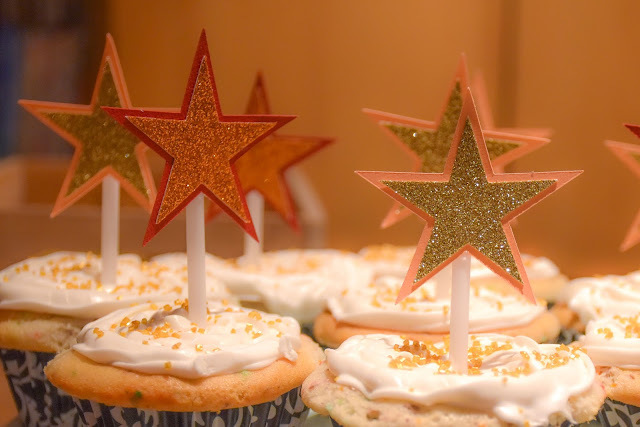 We put gold and antique bronze glitter cardstock toppers on our (very flat) cupcakes. I cut swizzle stick toppers from shiny Cricut pearl paper, adhering the paper to balloon sticks with washi tape. 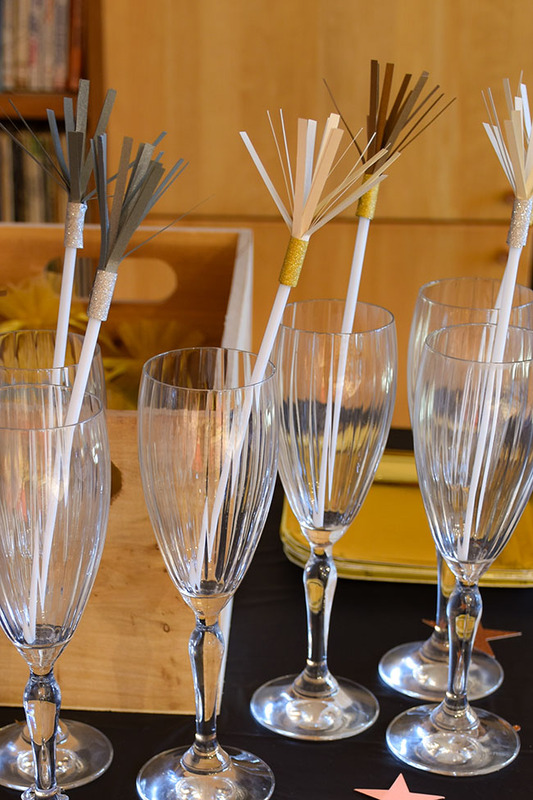 We put the swizzle sticks in champagne flutes to dress up the sparkling juice. My daughter came up with party games fitting an Oscar theme, like movie trivia and Oscar acceptance speeches composed in Mad Libs form. 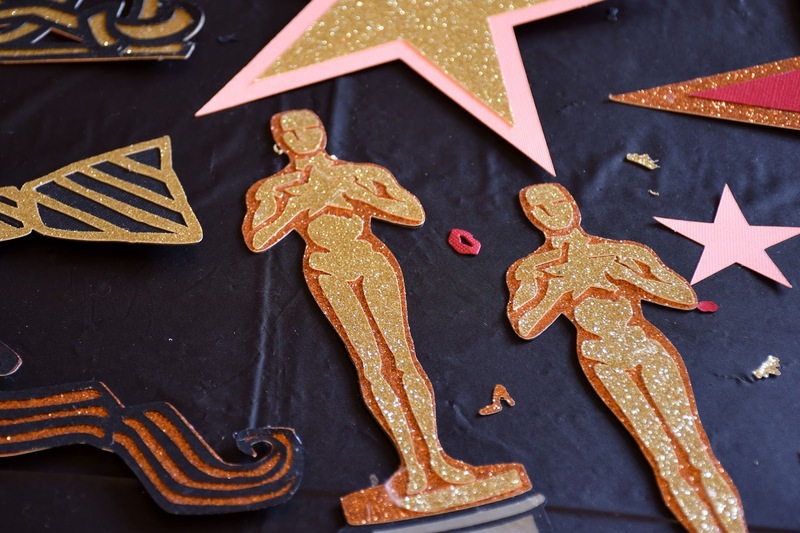 Of course, for the actual Academy Awards party, you can also print ballots and have your guests compete to guess the winners prior to the show. 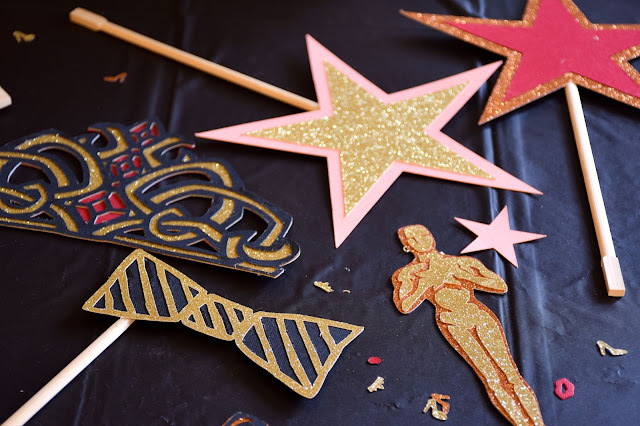 To summarize, here are the projects I made for our Academy Awards themed party. Click on the title to link to the instructions in Cricut Design Space. These projects are free if you have a Cricut Access membership. You can also find an Oscar party invitation here. Will you be hosting or attending an Oscar party this year? Do you like to watch the awards? Do you stay up until the very end? Great party decor ideas. I love your photo back-drop. The Oscars is a fun theme for a birthday party! Great decor ideas, too. Those are all nice ideas, dressing up for the occasion would be fun too. I just got my cricut and can't wait to start doing fun projects like these with it . Next on my wish list is a cuddle bug. I wish I had the creativity to come up with a party idea like this...this is just fabulous!!!! Lovely party, I like all the ideas especially tuxedo napkins! Loved the awards show this year. I have never thought of decorating for it and celebrating. Not sure I could find anyone to enjoy it with lol. Im sad that This Is Me didnt win best song.